NIA-CHARLESTOWN NEVIS (February 16, 2011) — Head of the Royal St. Christopher and Nevis Police Force Commissioner Austin Williams, urged fellow officers to be mindful of their public persona as they strived for a safer community. He made the call while he addressed officers at the 8th Police Constables Appreciation Awards Ceremony 2011 in Nevis on February 12th, an annual event hosted by the Strategic Planning Group of the Nevis Police Division. “I must encourage you to continue to promote among the ranks the highest levels of ethical behaviour and conduct despite the many challenges you might face in the execution of your duty. “As we continue to strive for safer communities through partnership, I want you all to be guided by some very simple things such as: the way you speak to citizens, the way you operate as a private citizen, the way you behave at social functions, the type of company with whom you associate all this provide a type of barometer in the measurement of your character,” he said. 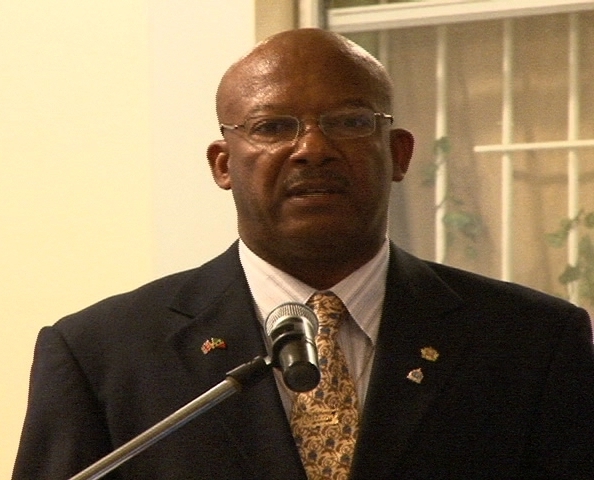 Commissioner Williams told the Officers that placing their lives on the line in the execution of their duty for the citizens and residents of the Federation was no mean task. However, he reminded them that the mission of the Royal St. Christopher and Nevis Police Force remained a priority and they would not relax their efforts in the fight against drugs, firearm trafficking and violent crime. The Top Police Officer reminded the Police Constables that the role and functions had expanded and their role included a much wider scope of activities. He told them they were the foot soldiers of the Law Enforcement Organisation, its first line of defence and the anchor that held it together. While he commended the nine Constables who were awarded, the Police Commissioner noted that they had been recognised for their extraordinary service to the public, their public safety performance, dedication, courage and untiring efforts under some dangerous and unwelcoming circumstances of work. Notwithstanding, he told then that as the spark and glory of the award faced they should continue to work diligently whether or not a tangible reward was publicly given to them, since true satisfaction came from true service and the selfless giving of oneself. Commissioner Williams also had words of gratitude to the Nevis Island Administration for its unstinting support to the Strategic Planning Group in its crime fighting and public safety initiatives. He also thanked members of the corporate sector who had on several occasions given of their time and money towards those initiatives. Family of police officers were also commended for their support. He reiterated that the job of a police officer was not the safest one on earth and spoke of the stress and discomfort suffered by family members as a result. The Commissioner noted that were it not for the love, support and encouragement from family members, the job of the police would be much a more difficult one.